When shopping for a gift basket for loss of a pet, it's important to make sure the contents of the basket have real relevance to the pet that is being mourned. A generic gift basket filled with random trinkets will not have the same effect as a gift basket with lovingly selected items. The death of a pet can be a traumatic experience that may be compounded by owners who might not feel as though anyone else truly understands their grief. After all, people who have never experienced the pleasure of owning a dog or cat may not realize the strong and emotional reaction from the loss of a pet. So, when someone you know loses their beloved pet, be sure to always express your heartfelt condolences to them. Sending a gift basket for the loss of a pet lets the recipient know that the sender feels sympathy for the loss, but also that the sender recognizes the very valid grief the recipient feels. A gift basket does not have to be elaborate or expensive as long as it is tasteful and well thought out. Purchasing a gift basket involves either buying a pre-made basket or buying all the contents separately and then fashioning it all together. The kind of pet the basket is memorializing - dog, cat, or other pet, as well as the breed. The name of the pet. The address of the recipients. Healing Baskets sells sympathy gift baskets and keepsake boxes for dogs and cats. 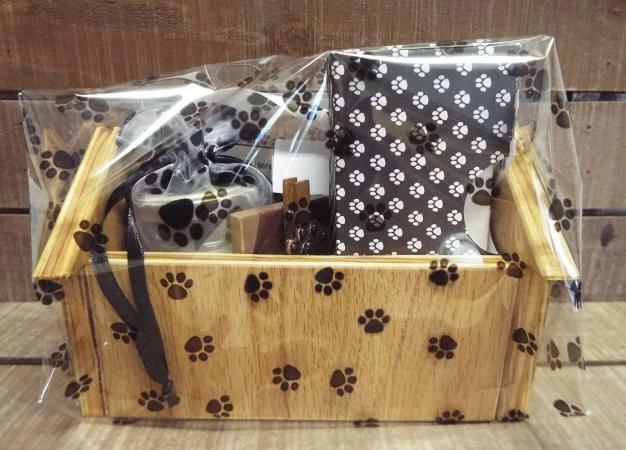 The paw print basket or keepsake box contains a variety of items depending on the basket you choose. These items could include a memorial candle, a picture frame, a book, a paw print sign, a pocket stone, etc. The prices range from $43.00 to $75.00. 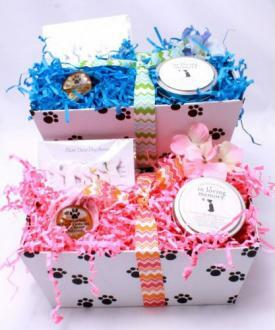 Eternal Paw Prints sells gift baskets designed for the loss of cats and dogs. They also offer a basket that would be appropriate for any pet. The baskets contain a variety of items depending on which one you choose. These items include a candle, a pewter frame, wildflower seeds, comfort chocolates, a photo stone, a journal, a garden memorial stepping stone, a Willow Tree hand-carved keepsake sculpture, etc. They range in price from $25.00 to $110.00. Etsy also has a nice selection of sympathy baskets for pets with a wide variety of options to choose from. The prices range from $18.00 to $99.00. Resist the temptation to deliver a gift basket filled with bulky memorial items such as engraved plaques or garden stones. The grieving owners may not want these items but might feel obligated to display them since they received the items as gifts. A memorial plaque or other large item is best presented as a single gift, and only if you absolutely know that the gift is appropriate. Local gift stores may be willing to put all the items you purchase together into a basket and decorate it tastefully for a nominal fee even if you don't purchase the items at that particular store. If you aren't able to pull the basket and contents together in an attractive way, you may want to consider getting a little help so the finished product is as visually appealing as possible. When some people lose a pet, their grief goes very deep. It is a devastating loss, much like losing a family member. So when you offer kind words of condolence or a sympathy gift such as a gift basket to acknowledge and honor the loss of their pet, they will never forget your thoughtfulness and kindness and it will forever be appreciated.